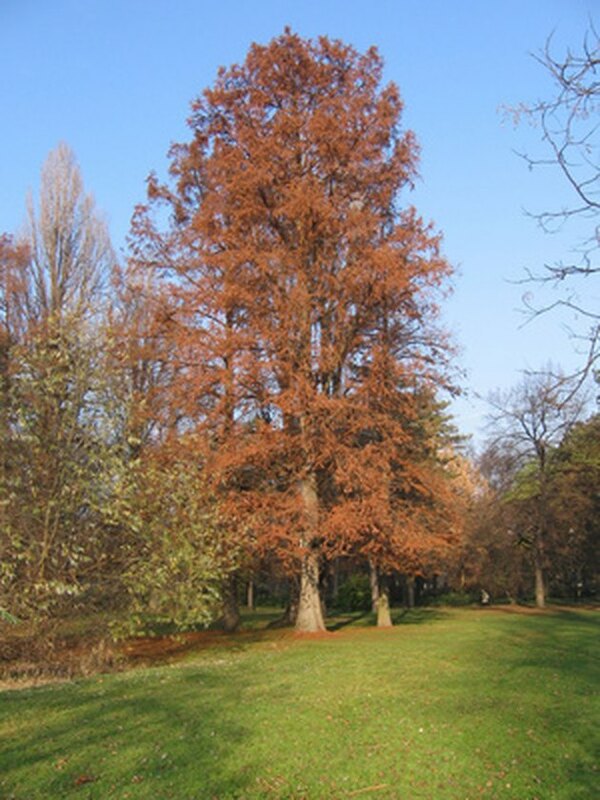 Native to the American Southeast and tolerant of moist as well as dry upland soils, the bald cypress (Taxodium distichum) is a deciduous conifer. Bald cypress can function as a street tree, tall screen or specimen tree near the water's edge. It matures to 50 to 70 feet high and 20 to 30 feet wide, although smaller cultivars exist, such as 'Shawnee Brave'. In general, little pruning is needed for this tree to grow with strong, well-branching structures. Dead or diseased branches warrant timely removal any time of year. Lower branches might need removal to allow for clearance if near a walkway or road. This tree grows best in U.S. Department of Agriculture hardiness zones 5 through 9. The rusty orange fall foliage of the bald cypress. Prune off low, rubbing or inward-growing branches in a bald cypress in late winter or earliest spring before new foliage emerges. Make cuts with hand pruners 1/4 inch above a lower, small branch junction, dormant bud or just outside the swollen collar tissue if the branch connects directly with the trunk. Lee Reich, author of "The Pruning Book" states that when head-pruning a branch (cutting its length tip to promote more side branching), prune back to a part of the branch that is still alive with dormant buds or foliage. Trim off soft new-growth foliage lengths with pruners or shears if you wish to limit the amount or length of branch tips in mid- to late spring. New growth is light green and doesn't mature with wood until mid- to late summer. Skip this step if you don't want to shape or limit the growth of the tree when it is small. Remove one of the two co-dominant leaders within the top of the bald cypress tree if one exists or develops later in the tree's life. The leader is the single twig or tip of the tree from which new branches occur. The leader matures to become the trunk and elongates to make the tree always taller. Prune out the crooked or less vigorous co-dominant leader by making the cut 1/4 to 1/2 inch above its attachment to the base of the desired, healthy leader. Cut off any drooping branches or those low on the trunk that limit access to nearby sidewalks, parking lots, driveways or roads. Use a loppers for branches between 3/4 and 1 1/2 inches in diameter, and a pruning saw for larger branches. Make the cut just outside the swollen collar at the base of the branch as it attaches to the trunk. Alternatively, prune branch tips back to prevent further lengthening of branches into areas needing clearance. . When Should Dogwood Trees Be Pruned? What Happens When Cutting the Tip off a Pine Tree?